Brand new and high quality spark plug removal tool. Comfortable to use non-slip dipped handle. T-Handle Bar allows larger Torque force and high pursuance. Flexible head allows access to confined areas. Plastic coated T handle - allows a good grip. T handle has a 3/8" drive fitting that can be used with any 3/8" drive Socket. Socket made from chrome vanadium steel. 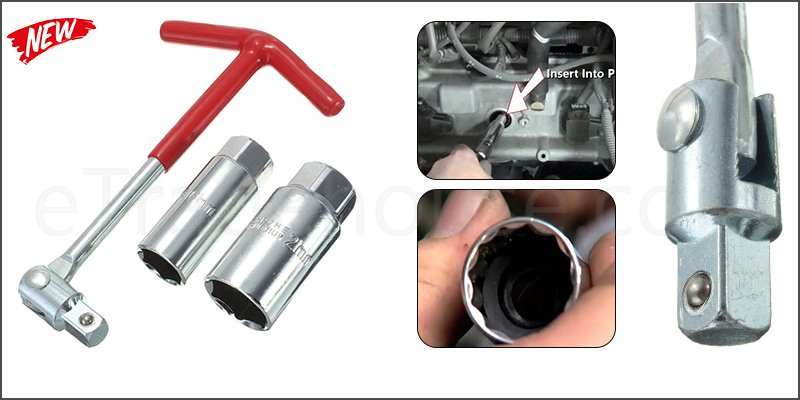 Rubber insert within sockets for spark plug insulator protection and spark plug retention. Comes with widespread joint function for enhanced access. Suitable for fastening and demolition of the spark plug sleeve. Socket length: 60mm (Total), 40mm (Internal) –approx. Tool length T handle: 160mm - approx. Socket length: 60mm (Total) 40mm (Internal) - approx.